Curvy girls are always prone to having different problems when it comes to maintaining different fashion trends. This means that they will often have trouble getting clothes that are meant to look good on them, especially when the whole fashion industry is promoting a type of body that is not the average size of women nowadays. But you can still look good and be trendy in 2012 if you follow these spring fashion tips. Embrace bright colors – they are definitely in this season and a lot of women have started choosing the craziest combination. When you are a plus size girl, it’s quite hard to choose clothes that are making you stand out but getting the right tones will make you look amazing. Red, orange, blue and vivid green are just a few of the colors that you should be using for your clothes this spring. If you fear that you might look bigger, you can choose darker shades but still make sure that you look colorful at the end of the day. Stripes – since stripes are in, girls that have a bit extra can look amazing. Stripes will always make you look a bit slimmer and might make you feel more feminine. Choose any combination of stripes you want because they are all fashionable, perhaps even with some great bright colors for ultimate trendiness. Maxi blouses – they are in this season and they can help you obtain a great look overall. You can use them with belts to mark your waist and you can also make sure that you wear them over your pants to cover some of the problematic areas of most curvy girls. Also, there is a great variety of tunics out there that might prove to be really amazing to combine with all kinds of trousers. Don’t limit yourself to dark colors, choose the brightest things you can and make sure that you create a look that will make you feel amazing. In the end, it’s not just about trends, it’s also about the clothes that make you feel comfortable or not so make sure that you take that in consideration too before starting to buy everything trendy. Since spring fashion is in full speed and fashion designers have already started thinking about what will we wear during the winter, it is about time to look what fashion trends actually worked this season and what people like wearing in the Spring of 2012. It is no surprise that colorful outfit where in fashion this year but as every fashion designer is unique, every combination of bright colors was also one of a kind. We saw bright red combined with dark blue and rectangular shapes to form a nice semi-professional dress and we also saw swimsuits with three shades of colors, so it is easy to say that things weren’t boring this spring. One would think that with so many colorful trends available, people will start forgetting about the boring black and white outfit; the truth is far from it and it seems that the popular two colors were still a big choice this year and this is due to the innovative ideas of some fashion designers such as Tommy Hilfiger and Jason Wu. Being chic with a touch of a sporty style has found quite a lot of fans and the style will also be seen during the colder seasons. Another popular trend that has to be in this recap is made out of super bold prints that make a fashion statement wherever you go. When we say prints, we mean very visible and popping prints that are sure to offer a vibrant look with an eye-catching design. Big floral designs and geometric shapes are just a couple of the trends that have taken over the streets and catwalks during this summer. We talked about bright colors as a whole trend but it seems that orange deserves its own place on this list due to the many fashionable outfits that have caught our attention. Orange was and is everywhere, from dresses to shoes and handbags, everything looks alive and joyful. Tangerine tango was the most popular color this season and it looked amazing on every fashion item you can think of. There are also other shades of orange to choose from if you want something a bit more special. When it comes to accessories there are a lot of variations that you can choose from, but bracelets are probably some of the most versatile accessories. Here are some of the most common types of bracelets and some tips on how to combine them with your outfit properly. Beaded bracelets are a great and cheap way to improve your appearance. There are literally thousands of variations and you can find many types of beads to make sure that they go well with whatever style you choose. 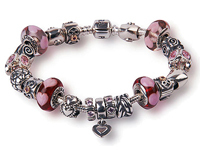 You can choose small beads bracelets for elegant outfits that would not only look beautiful but also make your whole appearance more sophisticated. These can be combined with necklaces made from the same material to complete a fascinating style. Big beaded bracelets are perfect for those who want to look more casual but also wish to show off their accessories. A type of big beads bracelet is the one that is hand painted with various models, they can be pricey but they are definitely worth it. You can also go for the colorful bracelets, especially during the summer, when they are so fashionable. Metal bracelets are for those going for a minimalistic but futuristic look. They are also great for those who like the steampunk subculture and you can find various brass models online and in handmade stores. You can even ask artists to create some for you, with the design you wish and all the colors you find suitable for your style. Thread bracelets may seem a little too childish but some handmade artists can create amazing pieces for all ages. They can be a great addition to your outfit when you want to make it more colorful or you simply want to add something unique to your look. They can also be friendship bracelets that you can offer to a friend and wear one similar yourself to show your appreciation and your deep connection. In the end, bracelets are not just ways to improve your look and make sure that you show your unique personality by adding different elements to make your outfit more pleasing to the eyes.